RedSky rooftop Bar and Bistro est., 2008 at the iconic Centara Grand hotel tower at the CentralWorld complex in Bangkok. Dynamic architectural design of layered concentric circles creating pods that extend out over the building as well as wrapping around corners creating cozy pockets. After dinner journey up the vertigo stairwell to the 56th flr balcony for a nightcap. 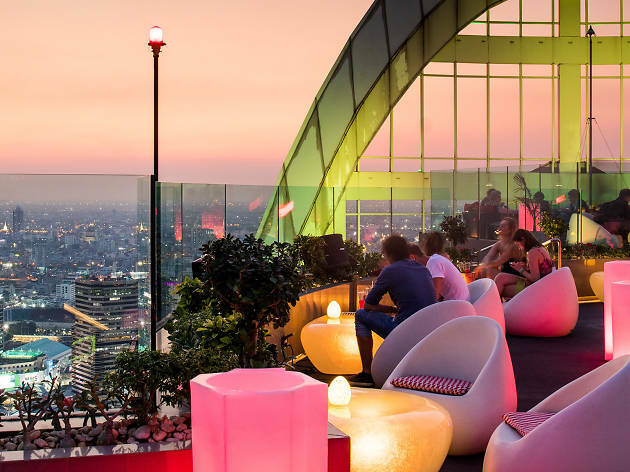 The balcony wraps around the building, select a table or slumber lounges and enjoy the 360 degree view across the entire Bangkok skyline. Indoor and outdoor seating.